A few weeks ago, I attended the WCARS hamfest in near Waynesville, North Carolina. I walked out of that hamfest carrying way more goods than I had intended to purchase (more on that in a future post–!). One of the best bargains I found was a Griffin Technology NA16029 PowerMate USB Multimedia Controller. The seller is a friend; he was trying (and succeeding) to push off a lot of his gear on me. We were actually in reverse price negotiations at one point–as he kept discounting prices, I was trying to raise them. Knowing I’m an avid SDR guy, he insisted I give this Griffin Powermate controller a go. I purchased it for $5 after I believe he had offered it for free (yes, the results of reverse negotiations). I took the controller home assuming it would be cumbersome to interface with my SDRs–what a poor assumption I had made! It was a breeze: simply install the driver, and launch its associated application. The software makes it very easy to associate PowerMate controller actions with keystrokes and other PC functions. The PowerMate is a brilliant piece of kit! It has enhanced my user experience with the Excalibur. Soon, I’ll set it up to work with my Elad FDM-S2, and SDRplay RSP. 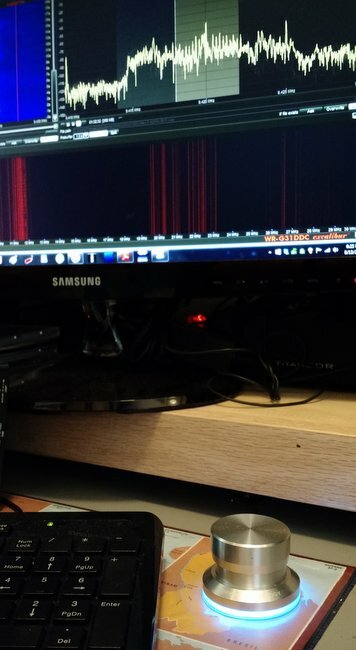 The PowerMate software allows you to set up multiple configurations, so it’s easy to call up a configuration based on the SDR being used (since mine have unique hotkeys). The good news is a new PowerMate is only about $32 via Amazon.com. I’m quite tempted, in fact, to buy a second unit to use with my laptop and to serve as a spare. While looking up PowerMate pricing, I noticed more complex multimedia controllers on Amazon; I’m curious if any Post readers have experience with other models. Seems to be a very affordable way to enhance your SDR user experience. This entry was posted in How To, News, Shortwave Radio, Software Defined Radio and tagged Griffin Technology PowerMate, Griffin Technology PowerMate SDR, SDR, SDR Griffin Technology PowerMate, Software Defined Radio on August 22, 2015 by Thomas. I also blogged about this maybe 2 years ago. My hdsdr settings are in the embedded youtube video and should still work with this controller. You mention that you like the Contour Shuttlexpress better than the Griffin. Can you elaborate a bit more? If I were to get only one, which would you recommend and why? I am interested to use these with SDRplay. I have both the Griffin and the Contour here at my shack. I prefer the Griffin due to it’s minimalist approch (one metal knob – high tech LED blue glow!). The Griffin is real quality, doesnt look or feel cheap. The Contour is plastic, but has far more capabilities due to all the extra buttons etc that can be assigned to radio functions. The griffin is butter smooth but on has one button you can assign as a function. The Contour allows me to add all the features i need at the push of a button. I would choose the contour. For tuning up and down, I believe I have mine set for “scroll up/down” or I associated turn clockwise with the up arrow key and turn counter clockwise with the down arrow. For bandwidth, you would be looking for the action that increases or decreases DEM bandwidth (BW). If I can remember, I’ll check on this when I’m back home. Got it, arrow up and down for frequency and B and shift B (or cntl B and shift cntl B) for demodulation bandwidth. The problem I had using the Powermate was that the center frequency of the DDC window would move as you changed frequency. I also wanted to control the frequency step and I could never get used to using the alt shift control keys with the arrow up and down. I also tried to get the Hercules DJ controller working with Winradio, but translating all the midi commands into keystrokes was too much for the WinRadio software. I tried using their low level .dll programming interface as well, but could not get everything working. However, I was able to get the Hercules DJ controller working with the RFSpace NetSDR. Thier software allows you to tune in frequency without the center frequency moving. I could also assign different knob to control step, muting, etc. Will the Griffin device work with SDRplay? Will the Contour Shuttle Express work with SDRplay? Thomas are you using the standard PowerMate config settings? I have been using a PowerMate as long as I have had my Excalibur, it’s fantastic, but it’s not set up to be quite as smart as how you have trained yours to function. If you have a custom setup for the receiver could you post the details? Once you launch the application, you can set up the Excalibur’s hotkeys to match the PowerMate’s actions. You might set up the PowerMate app to launch each time you restart your PC. On mine, I had to launch the app to have the configuration load each time I wanted to use it. 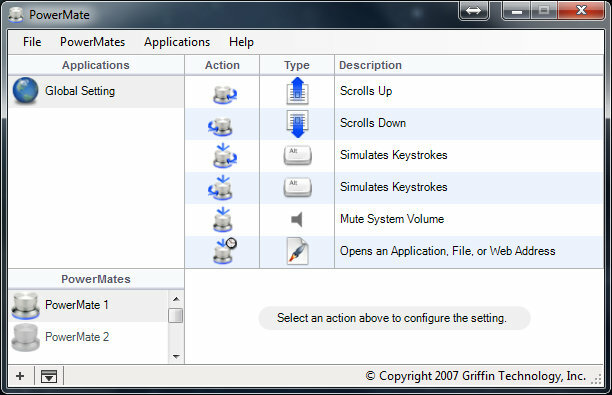 I use a Griffin Powermate on my Windows 7 PC as an external volume and mute control. The only problem I have with it is that sometimes Windows 7 can’t see it (“USB device not recognized”). The solution is to just swap its USB port with another device, and it comes right back to life. This would also be great for remote controlled radios like remotehams.com and others. Icom offers their actual VFO knob from their ham transceivers in a small box with two buttons for about $250… This controller would make an excellent substitute. Mike has some posts on his blog about controllers for SDR software. This post is about the Shuttle Xpress. (Its also the one I use) I picked one up off of ebay for about 20 bucks. Its amazingly better than using a mouse and keyboard for redundant tasks. He has also been working on a project to make a custom controller using the arduino.